Whether its a newly laid concrete floor or an existing/established concrete floor , the initial floor grind is what determines the type of polished concrete look desired. From a non-aggregate revealed polished concrete floor look to a full aggregate exposed polished concrete floor look, the initial grind is generally started with a course metal bond diamond matrix grit, however finer diamond grits are started with depending on the desired look and the nature of the concrete’s properties such as (Hardness of the concrete, porosity, condition left by the concretor’s ). As well as the initial grind, the metal bond stages are the aggressive of all the process, from 30 grit through to 100 grit. These stages do the course grinding and revealing of the aggregate within the concrete. There are a variety of metal bonds available to suit the concrete’s properties to make the grinding more effective and efficient such as: softer bonds for higher MPa rating or harder concrete too harder bonds for the lower MPa rating or softer concrete. The methodology behind these stages, is to grind the concrete to the desired overall appearance yet to be refined. Grouting is the process of filling small voids/pin holes and other defects in the surface that may have been obtained whilst grinding with the course metal stages and/or due to the porosity of the concrete itself. The grouting stage is generally performed with the final metal bond diamond matrix (100 Grit), which enables the grouting mixture to be pushed into the holes and create a more even consistency across the surface. This stage can be highly essential when porosity is high for greater results. Densifying or hardening is one of the most important stages of the polishing process, due to the properties of concrete. the cementitious properties of concrete are porous and the ability to polish this parameter of the concrete , is to harden it via a chemical addition. the process is worked onto the surface (sometimes multiple coats) then left to chemically react. When suitable time has passed for the product to finish its process, the surface will have a more even hardness for a greater gloss/shine . Resin bond diamond matrix grinding is the refining stages of the concrete polishing process, these range in diamond grit sizes from 50 grit to 3000 grit. They are critical for the refinement of the floor and for the overall gloss/shine. With the course resin grits removing excess densifyer on the surface, they are designed to refine the larger scratches achieved by the metal bonds by producing finer scratches, thus becoming less visible to the naked eye. In the final stages of the concrete polishing when desired appearance and gloss levels are achieved, sealing the polished concrete is a protection method for topical spills and contaminants staining the polished surface, whilst the sealer does give protection, in some cases some staining can happen due to time frame of clean up from the surface and /or the type of spill (aggressiveness). 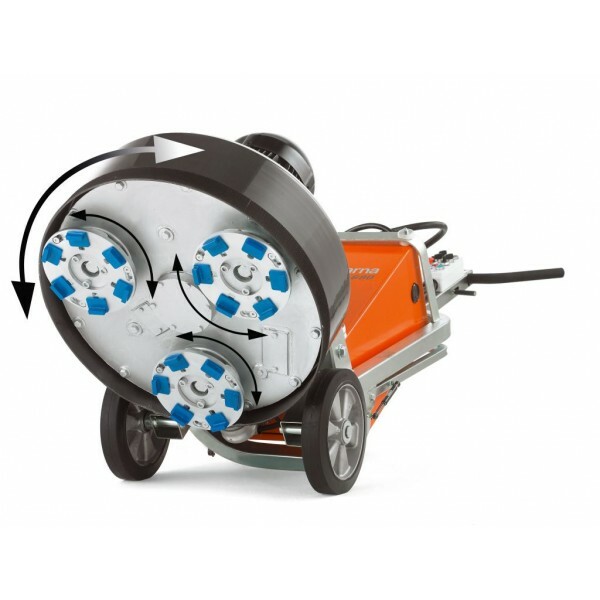 When the appropriate time has passed for sealer to penetrate and dry, a high speed buffer or burnisher is used to buff the surface clean and leave the polished concrete floor at its best.